Or click on these links to take you directly to a hotel page. The San Clemente Pier, built in 1928, surely doesn't disappoint while you stroll along and watch the surfers and fishermen. There is ample paid parking here and a really great walking trail that takes you right to the pier. The Fisherman's Restaurant and Oyster Bar has great seafood and a Happy-Hour that satisfies the taste buds. San Clemente State Beach is a clean beach and very relaxing but the sand is a bit pebbly. 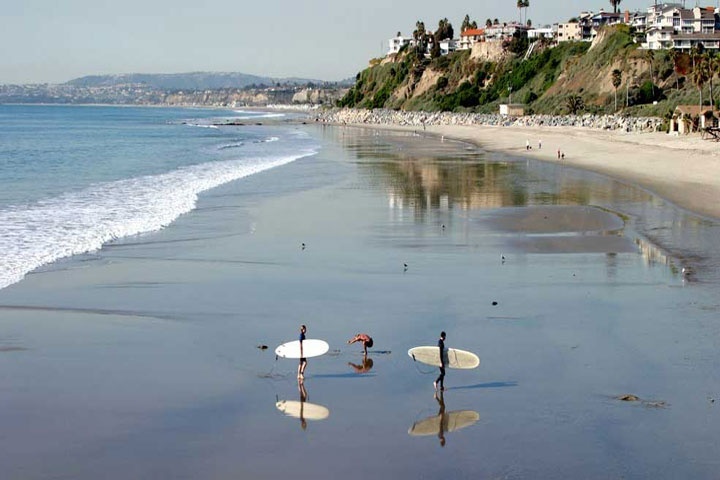 The walking trail is 2.3 miles long that connects North Beach to Calafia Beach with stops along the way at the Pier and T-Street. Lots of beautiful views and foliage to enjoy. This beach also provides a camping ground with fire pits. Summertime in San Clemente means great times at the main beach. Attending the annual Ocean Festival in July is a must here if you love everything ocean. There are plenty of activities for kids, sand castle contests, good food and various info booths, often giving away prizes. One event surely not to miss is the Rubber Duck race! The highlights of the festival are the sport competitions, including swimming and surfing. San Clemente State Beach entrance is reached via the Avenida Calafia exit.